I fought a couple of battles with its alarm “Hush” feature before I could get it to shut up reliably. IMHO, the user interface it presents is quite flawed. When you press the button (which does not present a tactile “click” so you know it was pressed), usually nothing happens. The blaring alarm and voice saying “Fire” continue as if nothing happened. Hush mode apparently only takes effect after any beep/voice warning cycle in progress has completed. Only then does it speak “Hush mode activated”, start a 10 sec LED blink cycle and stop making noise. Of course by then you’ve probably pushed the button several more times, and it may be that an even number of presses toggles hush mode off again. (Murphy also does his best to maximize the probability of that.) 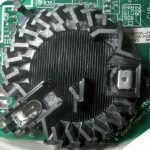 The spoken info and LED blink pattern are quite helpful, if you can ever get them to start. On the plus side, the piezo is pretty well sealed to the front of the device, so putting a thumb (or some duct tape) over it quiets it down a lot. 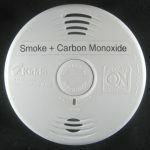 I was pleased that I’d opted to get both this photo smoke detector and an ionization one. And I was pleased I’d spent the extra 10 or 20 bucks for one that speaks. It says if both fire and CO are present, the fire notification takes precedence. I had psyched myself into thinking I might feel a little woozy, so started looking for CO. The furnace is in A/C mode and has electronic ignition anyway, so shouldn’t be a source. The only other gas device is the water heater. Its flue was cool, so I turned on a hot water tap to force it to cycle on. I was standing in front of the heater when I heard it fire up. The flue got hot to the touch in just a few seconds. Seemed to be working, though with CO it’s probably hard to tell. I took the detector outside in the clear, sunny 60 degree fresh air, but it kept alarming. I left it on the front step for a couple of 10 minute hush cycles, and it kept alarming. I took it to the garage and blew it out with compressed air, and it kept alarming. I considered taking it to the fire house, but by then I was pretty convinced the device was just broken. I called Kidde customer support, and after an annoyingly long hold, spoke to a pleasant rep, “George”. After explaining the situation, he took my name and address and said he’d send a new one (10 days or so), and that they didn’t need the old one back. When I asked how often that happened, he mumbled something not very helpful. When asked if blowing it out again/some more might get it working again, he replied that it might, but there was probably just something lodged in the photo path. I thanked him and said good bye. Hmm – I read the user manual and it said not to put it close to an attic fan – but that’s right where it’s mounted. Is that because the fan whisks smoke away too fast, perhaps making it less sensitive? Or because it is likely to blow junk into the detector and cause false alarms like this? I felt a little naked with no CO protection, but at least we still had the ionization smoke detector. I can’t keep pressing the hush button every 10 minutes for ever. Should I activate the no turning back death/deactivate switch on the back? There was one clip visible from the back that looked like I might be able to open it up, so I tried that. After releasing it and its three brothers, the unit opened neatly. 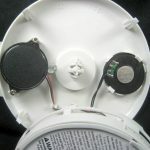 The cover holds the piezo and speaker. 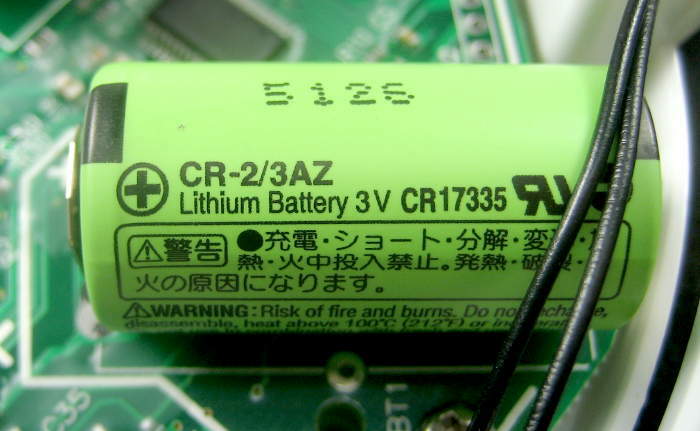 The lithium cell was unsurprising. I didn’t know what to expect for the chemical CO detection cell, but this must be it. 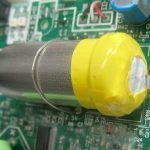 The only mildly interesting bits were what looks like a glass diode mounted up off the board and marked “R55”, and the fact that they’d flowed wax over many (but not all) of the components. I figured I could at least scavenge the little speaker (but fortunately hadn’t cut the leads yet). While I had it open, the hush cycle ended and it started alarming again. 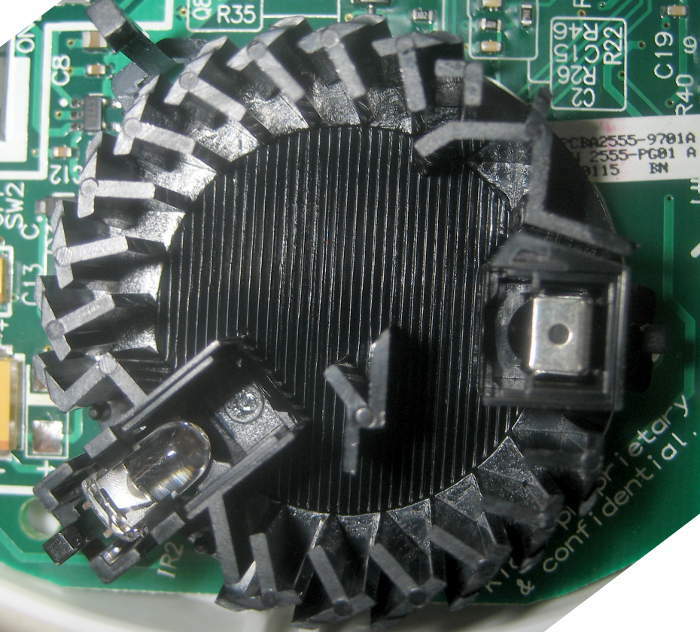 The click-less spring contact in the middle was obviously the hush/test button, so I pressed it and started a new hush cycle. 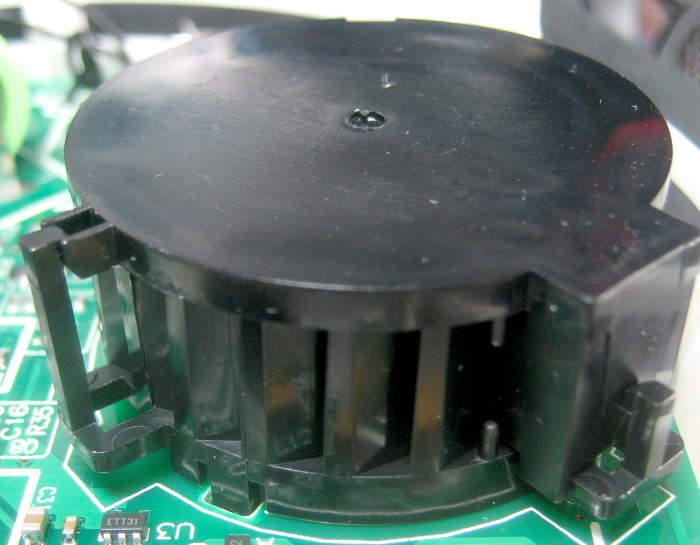 And then there’s the photo sensor chamber. The top is held down with 3 easily released clips. I opened it up and noticed with interest that the slitted walls were shaped to provide a sort of swirl pattern inside the chamber. Or are they just light baffles? The LED and photo detector were clearly visible. That looks like a barrier directly between them, so maybe it works by IR scattered off smoke particles. It started alarming again as soon as I opened the chamber. 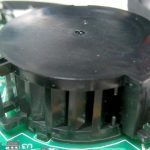 The optical dark provided by the removed chamber top was obviously wildly violated, and each time I’d start a hush cycle, it would abort the hush just as the manual said it would if there were very dense smoke. That was annoying, and I’d taken my pictures, so I put the chamber’s cover back on. It clicked in place reassuringly. And then it said “Hush mode cancelled”. And didn’t alarm any more. Huh? I ran a test cycle, and as advertised, it played 2 cycles of 3 beeps and “Fire”, and 2 cycles of 4 quick beeps and “Warning, Carbon Monoxide”, and then it was silent. Had the wildly out of spec light on the detector forced it to reset or recalibrate or something? I put the main cover back on, and it seated with a satisfying click. I lit a match (with considerable difficulty: maybe I should get some fresh matches!) and when it went out blew some smoke at the sensor. It alarmed in seconds, with 3 long beeps and “Fire”. I pressed the hush switch (only once, having learned that lesson) and saw a little blink. Though I don’t think I heard the voice message, it did go into the 10 sec blink pattern that indicates hush mode. I promptly blew the unit out with compressed air. It continued blinking for a couple of minutes until I pressed the button again. It said “Hush mode cancelled”. And it remained silent. 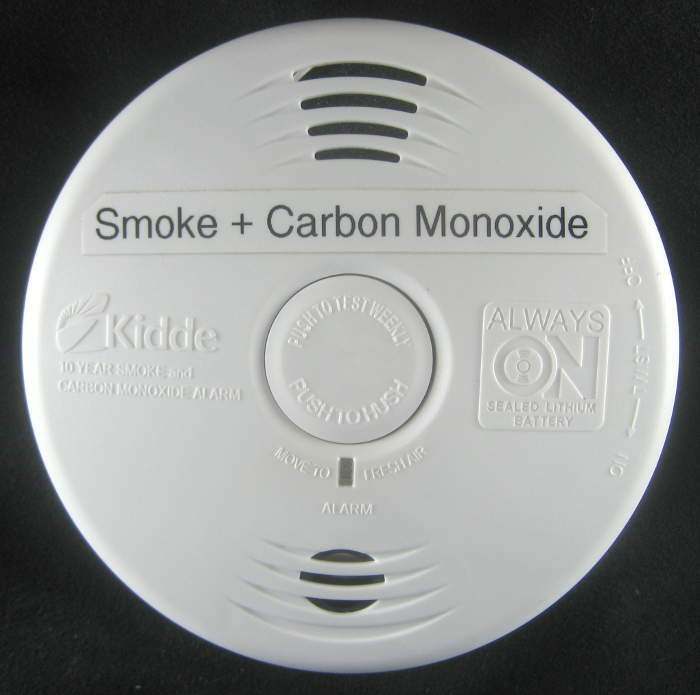 Does smoke detection actually work again? I started up the 4 stroke Craftsman lawn mower (don’t know how much CO the Prius puts out) and held the detector in the exhaust stream for several seconds, but to my great surprise got no alarm. I pressed the button for a test cycle, and got 3 long beeps, “Fire”, 3 long, then 4 short, “Warning, Carbon Monoxide”, 4 short. It ended maybe with one more very short beep. I held it in the running mower’s exhaust stream again for a good 30 seconds, but nothing. I used this test on a CO detector before and had no difficulty triggering it. I can’t believe the mower isn’t spewing substantial CO, so now I have no confidence in the detector’s CO side. Yeah, I opened it up, but wasn’t aware of doing anything that might interfere with the CO side – and it passed its internal test. I’ve put this one back up for now, but I’m glad a new one will be here soon! Update 9/13/17: As promised, I received the replacement Kidde P3010CU on 9/2, and promptly replaced the old one, using the old mount uneventfully. Today (9/13) I got around to redoing the CO test, just for the warm fuzzies. I held the stack of 3 detectors – old and new 3010CUs and the the 3010K-CO from the family room – in the exhaust stream of the 4 cycle mower for a good minute. To my utter amazement, none went off. 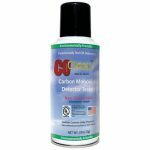 I started the Prius and as quickly as I could, before the catalytic converter heated up, held the 3 detectors in its exhaust stream. To my further amazement, first one, then a second went into fire alarm mode! After a minute or so, the engine shut off, as expected. Between my surprise at fire alarms and a lot of noise (two sets of 3 beeps and at least one saying “Fire!”), I didn’t properly note which detector was doing what. At some point shortly after the engine shut off, I’m certain I heard at least one set of 4 quick beeps – the CO alert all of them use. I pressed the terrible “hush mode” buttons, with even less success than expected, and blew all 3 out with compressed air in the garage. The noise subsided, but the new 3010CU kept up its fire alarm. Each time I’d press the hush button (well, at least many times: that button still gives the appearance of being terribly unreliable) it would say “Hush mode activated” and be quiet. But only briefly: in a few seconds it would go into loud alarm mode again. That’s consistent with its described behavior in the presence of dense smoke. It was in the house by then, and I blew it out again with lower pressure air in the shop. Still the same behavior. 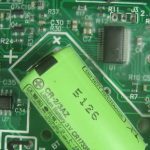 Does the 3010CU have a “stuck in fire alarm” bug? I whacked it lightly against the heel of my hand. And it stopped! Coincidence? Who knows? But at least the racket has stopped. Several minutes later I pressed the button on each to trigger test mode. The old CU and the K-CO responded with the expected test noises. But the new CU did not. I set it next to its elder twin and watched two flashes from the older one and none from the new. It’s supposed to flash once/min for the first 10 minutes after a test – then once/10 min. But now I can’t get anything out of the new one. Major bummer. The way forward is very unclear, but I put the K-CO back up in the family room and the old CU the the main upstairs hallway location. Humpf. Update a couple of hours later: Wow. Having nothing much to lose, and with the unusual data point that I’d jarred it just before it shut up permanently, I opened the new detector. I forgot that inserting the pick/release tool outside the foam strip around the outside edge left little/no evidence of tampering. I hope that fact had been relegated to “should never need this again” status. Again, I hope to never open one of these again. I looked first at the power switch. It was a little to the right of center (as oriented in this picture). Looking at the label directions on which way to turn to shut it off, it seemed like “to the right” was the off position. I moved it a little to the left (like by the amount of slop allowed by the white plastic operating dogs flanking the handle) and it beeped! Maybe it said to press the test button – not sure. Encouraged, I moved the switch and the white plastic operating mechanism all the way over to the left, which I presumed was ON. Silence. There also seems to be interaction with a white tab in the mounting slots that would probably be moved when you first twisted it into place. A little incredulous, I moved it all so the switch was in the center of its travel (as in the picture above). It beeped and then for sure said “Press test button” (or close). I did (using the exposed contacts in the still open device). It beeped and probably went thru a test cycle of fire and CO. Great – it looks like it works again! And then it went into fire alarm. The first step was to get some duct tape to cover the piezo so I could stand to work on it. I pressed the hush button (once) several times, and each time that it worked (most) it continued the alarm noise cycle in progress, then finally deigned to say “Hush mode activated”. A few seconds later it started alarming again. Bummer. Now pretty desperate, I recalled that the old one somehow reset after I opened the smoke sense chamber. I opened that, inspected it (saw nothing), blew at it, and closed it up again. (All the while pressing the button contacts frequently for a few seconds of quiet.) No change. Opened it again, blew it out again, held it more in the light, closed it up. And hush mode stuck! I waited a minute or two, put the main cover back on and pressed the button again. “Hush mode cancelled”. It’s been quiet ever since. I ran a test cycle several minutes later, and that performed exactly as expected. More confident than before that I’d actually somehow fixed it (reset is more like it) and that it was probably working fine again (and relieved of the darned noise), I turned my attention to the unexpected “only center on” switch position. Fortunately, I happened to have another of the same model of detector which seemed to be working, and whose switch had never been touched. 🙂 I opened that old one back up, and found the switch right in the center of its travel! That’s the picture above. Wow. 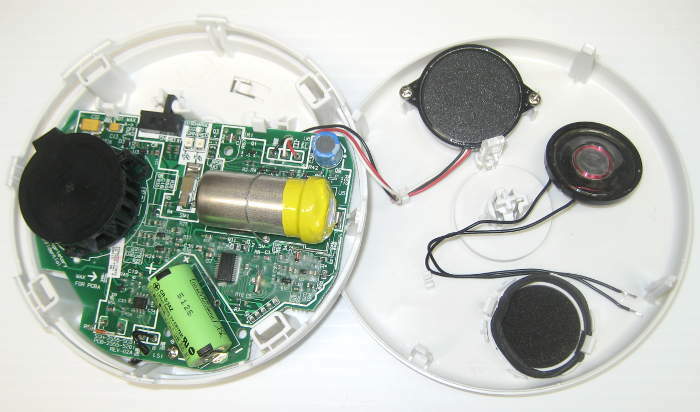 I wonder if it’s a real 3 position switch, with left=battery disconnected; center=battery connected; and right=detector disconnected and a short/resistor across the battery to render it safe. 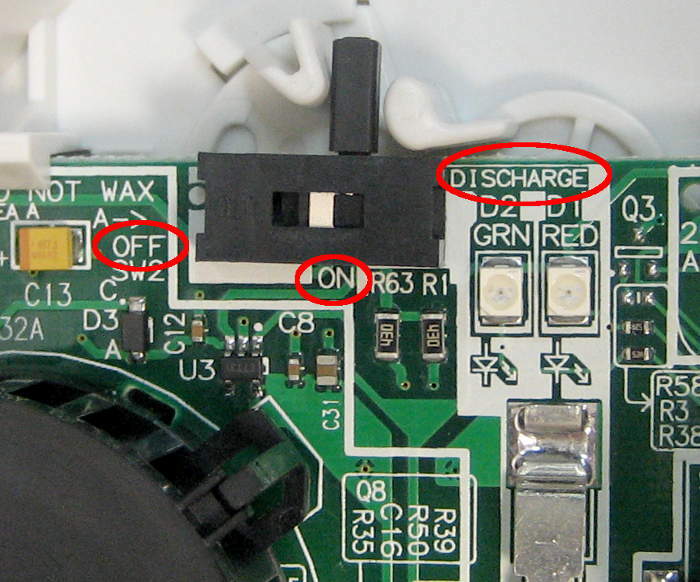 Hmm – in not obvious but vaguely appropriate places (for a crowded board) OFF, ON, and DISCHARGE appear in the silkscreen, in support of the 3 position switch theory. 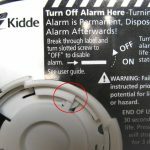 I found a post here (about an i12060ACA) mentioning that Kidde support told her to “… hold the ‘Test’ button down for 2 sets of three beeps, then release. This resets the alarm. ” I wonder if this is a common undocumented feature? Terminally infected with the thoroughness bug, I did an actual smoke test on it. (The matches from the mostly-full carton dated 10/10 that had been sealed in a ziplock bag lit much more reliably than the ones (probably from the same carton) that had been sitting in a parts drawer for some years.) It took a couple of matches, but it went into alarm, and hush mode activated and shut it up. I blew it out well with compressed air and hit the button again. “Hush mode cancelled.” I’m now confident enough that it works that after I put it back up on the hallway ceiling I’m going to forget about it. And I suspect the first one is also quite functional. The specs for CO detection mention times from 4 to 240 minutes, so maybe my expectation of triggering an alarm in a few tens of seconds was inappropriate. It seems to me the previous successful testing might have been on a dedicated CO detector that had a concentration display. Maybe I just noted that the display showed more CO. In any event, I can get a can of spray CO (!?) designed for testing CO detectors for 12 bucks on Ebay. I’ve read that each test desensitizes/ages the detector, so testing is a double edged sword. And I don’t think I’ve ever read anybody saying the detectors last over 7 years (OK, except implicitly in the advertising for the 10 year units.) But it would at least give some warm fuzzies that these detectors I’d opened up still functioned for CO.
Update ~10/25/17: I never received the can of CO, so contacted the seller thru eBay. Though I indicated I still wanted the product, he promptly sent a full refund. Yeah, I got my money back, but what I wanted was the CO tester! Bummer. Update 11/19/17: I woke up at 6AM this Sunday to “Beep beep beep”. I followed the noise downstairs, walking directly under the (silent) new replacement Kidde P3010CU in the upstairs hallway, and then directly under the (also silent) 3010K-CO in the family room. As I got closer to the noise, I could hear it speak “Fire” between triple beeps. Following the noise led to the old, originally failed P3010CU sitting on a self in the basement. Dumbly holding the annoying noisemaker in my hand, it soon occurred to me thru the morning fog that I could push the “hush” button. Of course it didn’t shut up, but then recollections of past experiences came back, and I gave it one firm push at the end of a beep/speak alarm cycle. I don’t know if it had occurred to me that maybe the button is only polled at the end of each alarm cycle. Anyway, it said “Hush mode activated”. Good. And then it started alarming again. I played the game with the button again, and eventually got it back to hush mode. I turned it around ’til I found the black plastic smoke sense chamber and gently blew at it a few times. I pressed the button again, and got “Hush mode cancelled”. And silence. After it appeared to have come to its senses (and passed a basic match-smoke test) after the initial event, I couldn’t stand to just kill it (with the disable/discharge switch on the back), so it was just literally put on the shelf. And once again, the device failed with a false positive to some non-olfactible stimulus. But at least this time it had the decency to (at least appear to) recover with a simple ventilation. It’s back on the shelf now, silent, future unknown, but trusted less. Kidde did exactly the right thing by promptly replacing it. I guess such false positive failures are pretty rare (which is a good thing!). But at least this one is chronicled here. 7/6/18: The alarm went off with a false positive in the middle of the night – just enough cycles to get me out of bed, but not enough to verify what the heck was making that noise. Then a couple of nights later, it did it again – but this time I caught it in the act. Now what? First, make it shut up! Using what I’d learned, I pushed the button just at the end of an alarm cycle, and it said “Hush mode activated”. Good. Started alarming again. Bad. Same dance again – same result. 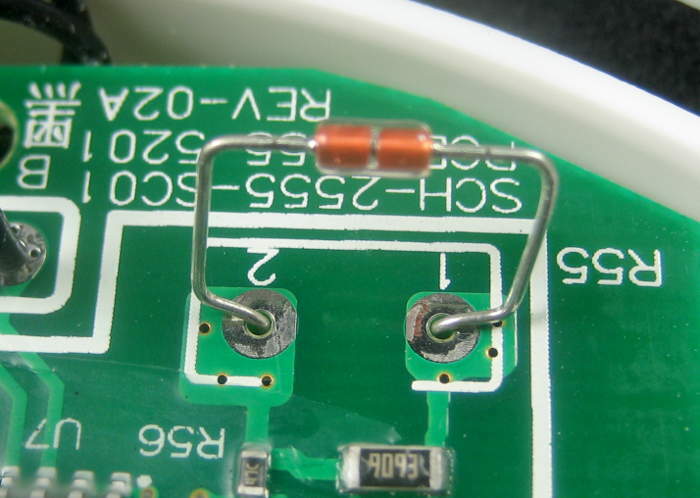 OK, put some tape over the dumb piezo. That’s better. I popped the clips and opened it up. A little manipulation, and I got the switch back into the OFF position. Noise stopped. Good. 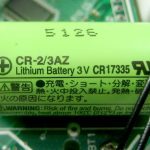 Checked cell voltage – 2.95V. That cell’s blown some of its energy making noise all those time, so it’s probably not worth saving. Now what? When I got back to it (days later), the plan was clearer: Scavenge what’s worth saving, toss the carcass. But what about the cell? Yeah, the responsible thing is to discharge it. With sadness, I moved the switch to DISCHARGE, wasting whatever energy was left in the cell. 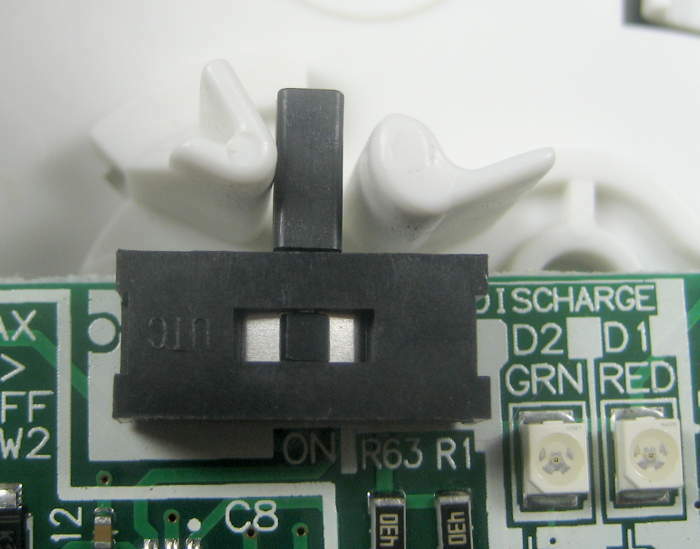 Here’s the mechanism that manages the switch, with the moving part highlighted. 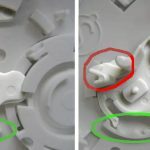 The dogs that move the switch are marked in red; the ratchet that ensures you can’t ever turn it back on after moving to Discharge is in green. Left is Off; right is Discharge. The label with instructions on final discharge is still intact, as I moved the switch by hand with the case open. 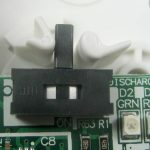 The tab that moves the switch from Off (as shipped) to On is just visible under the tabs that hold it on the twist-n-lock mounting bracket. 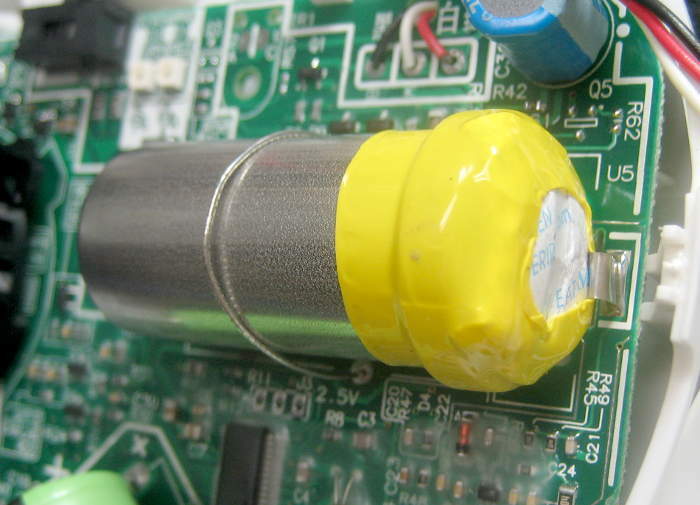 I pulled the 3 wire piezo, as well as the speaker – with its fragile clear film cone. It was marked as 8 Ω, but a test with a 1KHz signal showed more like 20-40 ohms. Go figure. Anyway, the multiple false alarms sealed its fate. Since it wasn’t an ionization sensor, I didn’t expect disposal warnings, and found none. Into the electronic recycle box. RIP. 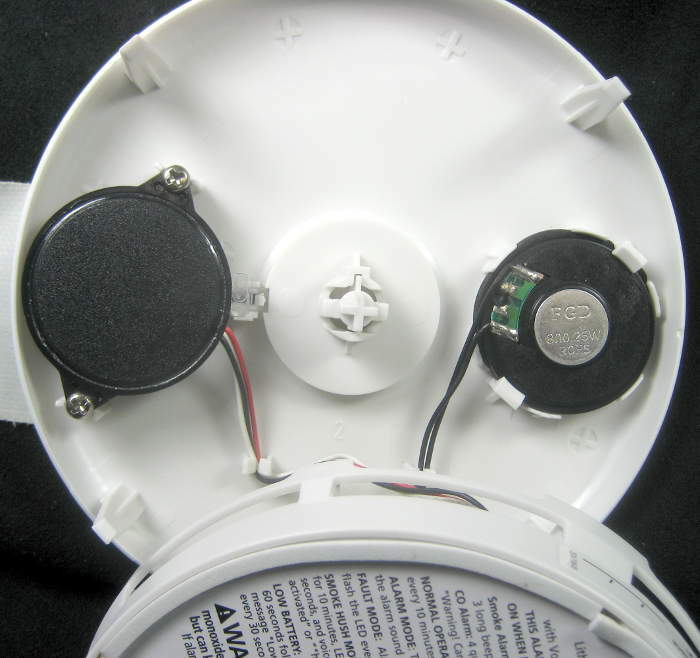 This entry was posted in Home Repair and tagged co detector, continuous alarm, fail, false alarm, false positive, Kidde, P3010CU, smoke detector. Bookmark the permalink. Thank you for this. I thought I was going crazy. I bout a 2 pack of the P3010CU alarms in Jan. 2018 and finally installed them in March. One night at 3:30AM the fire alarm and voice alarm sounded in my bedroom – not fun for me or my dog. I took it down, pressed the hush button and all of the same things you did. I wasn’t able to open it as easily as you did, but whatever I did to it, it stopped beeping. I took it back to Home Depot and got a replacement. Last night, the darn thing went off again. I could not get it to silence, and ended up wrapping it in a winter coat, putting in the bottom of a bag of donated clothes and shoving into a closet, where the other detector was located. The next morning, I took it to work with me to see if that would stop it and it did not. No fresh air, no new environment, nothing would stop this thing from going off. 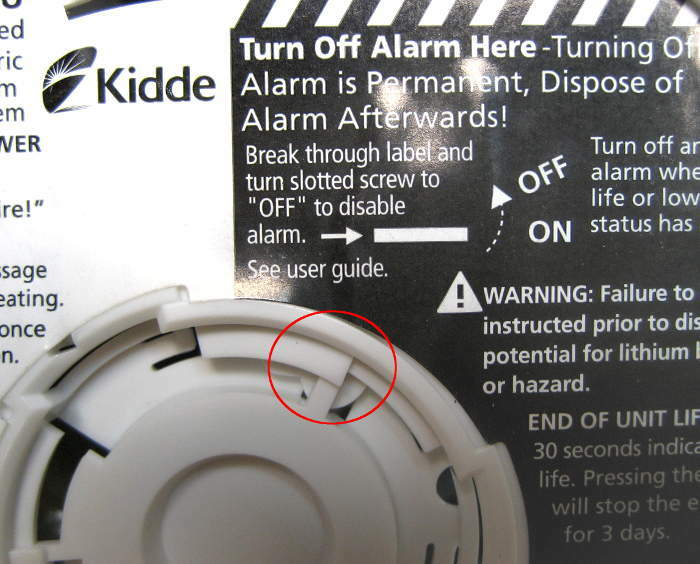 I am going to call Kidde this time and hopefully get a replacement, because the people at Home Depot are going to think I am nuts if I go back again. Always glad to help someone feel a little less crazy! Sorry to hear about your alarms – but glad they were just false positives. I hope Kidde provides you with the same prompt and fairly painless replacement service it gave me. Jim, thanks for your thorough write-up! But I’m confused about what you said regarding putting duct tape over the ‘piezo’ to quiet things down. 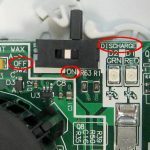 Do you mean covering what looks like speaker slots on the unit’s face-plate? Three weeks ago, I had two false alarms in one day. I vacuumed the side vent slots, and so far no more falsies, but I want to be prepared if it happens again. 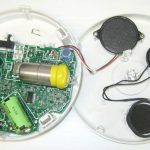 The P3010CU I have has two independent noise makers – a piezo buzzer for the loud, obnoxious beeping, and a speaker for the voice messages. 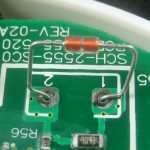 The piezo is under the smaller of the 2 sets of openings on the face plate, the one near the bottom when the lettering is right side up. That’s the hole I covered up to be able to stand to work on it.